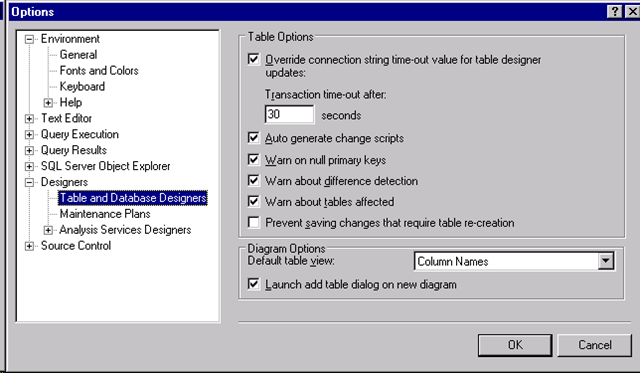 When you design a table in a database and then try to make a change to a table structure that requires the table to be recreated, the management tools will not allow you to save the changes. What a pesky problem. It prevents you from making progress when you making database changes. It’s a good thing you can turn it off. Here’s how you fix it. In Management Studio, go to Tools –> Options –> Designers –> Tables and Designers and uncheck the Prevent Saving Changes that require table re-creation option. Now Management studio will work like expected. Microsoft recommends you don’t turn this option off and that you use T-SQL to make changes to your tables. Turning off this option will conflict if you have Change Tracking feature turned on. If you turn off this option and make a change to table with change tracking on all the tracking changes for that table will also be deleted. To check if you have change tracking turned on, right click on your table and go to properties, look for the option Change Tracking. This entry was posted in Management Studio, SQL, SQL Server 2008 and tagged Column, Context menu, Data type, Database, Management Studio, Microsoft, Microsoft SQL Server, SQL, SQL Server 2008, SQL Server Management Studio, Tables. Bookmark the permalink. Thanks – such an obvious fix, but I was struggling to find the option. I thought I was going to breeze through a simple installation. It was my first time using 2008, but I thought it would be similar to 2005. Then as soon as I get started I get stuck on this stupidity. Tried searching to no avail. until I saw your post. What a waste of an hour. That option drove me crazy. I am sure it there for a reason, but what a pain! Thanks a lot mate. Had to create new table previously. Just found your post. What a relief!!! Why do Microsoft have to constantly fk up my life. Thanks for the post. What were they thinking, that the millions of developers would never want to edit a schema? Why does it have to recreate the table just to add a column? Why doesn’t it just use ALTER TABLE? Thanks for the post. Saved me a lot of headache. Thanks, Your post solved my problem as well. Thanks, It’s really help me. Thanks. Would never have found it. This only applies to SQL server management studio 2008 and higher.